Remember this lovely little stack from my new favorite crap craft store? I sewed like a maniac and now its a quilt for my sweet sister in law’s wedding gift. It was between making her a quilt or buying floor mats for her car ( n.o.t. my idea). Needless to say the quilt won. The quilt measures about 67” by 80”, perfect size for a 2 person couch quilt, or draped over the end of a bed. Here’s my measurements if you want to make your own. Sew short sides on first, then top and bottom pieces. If you are not using 1/4” foot (like I wasn’t) you will get some hangover in your strips that you’ll have to trim. The seam allowance on a regular foot is more like 5/16” or 6/16” in my case, so slightly larger than 1/4”. So if your strips seem way too long, especially in the outer border, that is probably why. 2- 2.5” by 8.5” strips. 2- 2.5” by 12.5” strips. 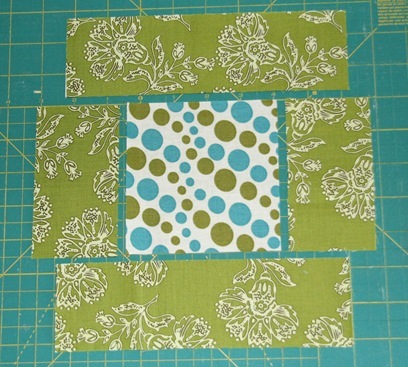 Your finished block should measure 12.5”. See that little bit of hangover on the top and bottom of my block? That’s because I didn’t use my 1/4” foot, so my finished block was more like 12”. Which isn’t a big deal unless your using a (real) pattern or you’re concerned about the final size. Now square up your blocks. I made 30 blocks, I used about 4 yards of fabric for my blocks. The sashing strips were 1.5” cut, so 1” finished. The white border strips were 2” cut. 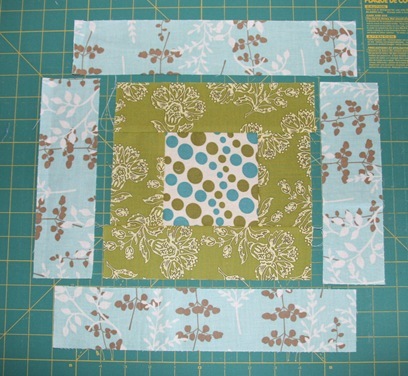 When your using thin stashing strips like this its important to pin and line up your blocks as you sew your rows together. If not you can really tell when your blocks don’t line up perfectly. And unpicking stitches is not that much fun….as I’m sure we all know very well. By the way Ben did fabulous on our flight to Denver on Monday. The travel fairies must like me because we sat by a Nun. You can bet she was prayin’ like a mad woman when she saw who was sitting next to her. And luckily all went smoothly and I only had a few glares in my direction, so we’re improving. :) Have a great weekend! Love the colors! Great directions! Lovely, lovely quilt and what a nice gift. And thanks for the instructions! beautiful job!!! is a perfect goft for a wedding! thanks for sharing. thanks for sharing. it's beautiful! i'm so not good at putting things together yet unless they come from the same line. maybe this will get me out of my box? This quilt is wonderful, I especially love the colors. Thanks for the details on the block. Your SIL is going to love it! I LOVE THIS QUILT!! I think this will be my next quilt project! THANKS! What a neat looking quilt…..it definitely caught my eye! Thank you for the tutorial. 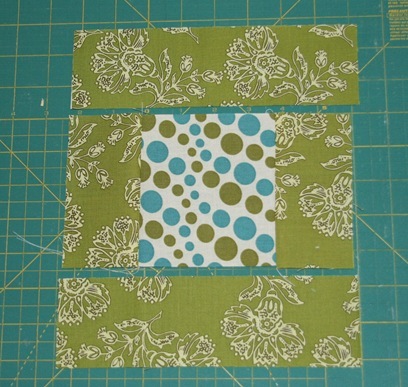 It is always so nice when a quilter has a tutorial. Was it one line of fabric or a mix? I have a lot of those same fabrics from Hobby Lobby! Your quilt looks terrific! I can't wait to hear how those fabrics wash up; I haven't washed mine yet. Wow, love it. What a great wedding gift! I really like those colors together. Lovely quilt! I am completely using your pattern. 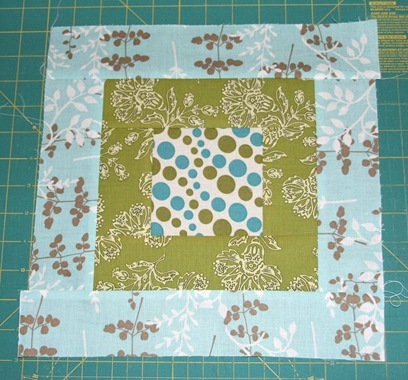 I love this quilt and have just the fabric to use it. Gorgeous. This quilt is gorgeous! What a wonderful gift. This quilt looks wonderful. I love the colors together. Great job, it's beautiful! And congrats on the successful plane ride. Planes and kids can be scary. The quilt is beautiful! Glad to hear your travels were safe and smooth. I love the colors on this! And the striped binding! this is beautiful thanks for the instructions!! maybe when i can get some of my other WIPS out of the way i can try this one out. I love this quilt! Another beautiful one to inspire me! Beautiful! I love basic designs like this! i can't believe you sat next to a nun. god does have a sense of humor!!! I love the quilt and recognize some of those fabrics. Yes, I shop there too. ;) I use my 1/4" foot almost everytime I sew. I have only had it about a year and was sooo worth the 10.00 bucks. The colors are gorgeous. She'll love it. Wow! This is really lovely. What a treasure! The quilt is perfect – simple, pretty and "soft" looking. Thanks so much for the directions; I've printed them for future use! looks perfect! i'm a sucker for wedding quilts… i think they are so much better than a set of plates! Oh, it's beautiful. They'll love and treasure it! Quilts are such wonderful gifts! I love this quilt. I love all of your quilts! Every time I see one I say to myself "oooh, that will be the next quilt I make". Every time! I can't even remember anymore where I found your blog but I am so happy I did. I think your quilt is beautiful….not only the way you put it together but the colors are so soothing, peaceful, and calm. Thank you so much for sharing the directions. I really like your use of fabric in this quilt – such colour and texture. Way better than car floor mats. Fantastic quilt for a wedding present! I'm so glad you posted this! I am fairly new to quilting and would like to make matching quilts in these very colors for my two youngest boys that share a bedroom. Their carpet is a aqua, brown, tan berber and the walls are tan. 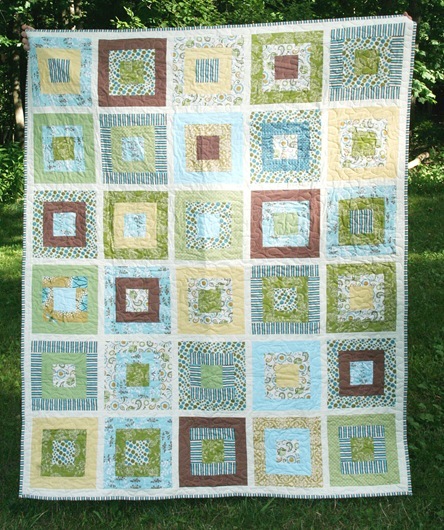 I was really hoping to find a quilt tonight in these colors and I did! Thanks again for your beautiful blog! Very cool idea! Thanks for posting about Buy Quilts Really it is very helpful. Awesome job !!! keep it up. I just love this quilt. Maybe someday, when I have cleared my plate of my current projects and want something a little simpler than the quilts I've been making, I'll go for this. Thanks for your darling quilt pattern. you are such an inspiration to me I love your beautiful pieces. Thanks so much. I made my daughter a quilt for her bridal shower with pinks and purples, silver and greens. This is so lovely & for a SIL–you go girl. She is so very lucky to be inheriting you with your talent. Bet she will want to learn to quilt! Celebrate your God given talent & your graciousness. Thank you for your timeless instructions for this quilt. To me this is a scrap buster.